In the early 1920's, on a trip to England, Count Camillo Negroni took a liking to gin, which wasn't a very Italian drink. Upon returning to his local bar in Florence, the Caffe Casoni a popular hang out for the aristocracy and American English tourists of the day, he asked his barman, one Fosco Scarselli to splash a little of it ("muscle it up a bit") into his usual morning cocktail - which until then had been 'Un Americano'. He liked the drink. Bartender Fosco Scarselli liked the drink. Barman Scarselli perfected it - and called the new cocktail the 'Negroni'. 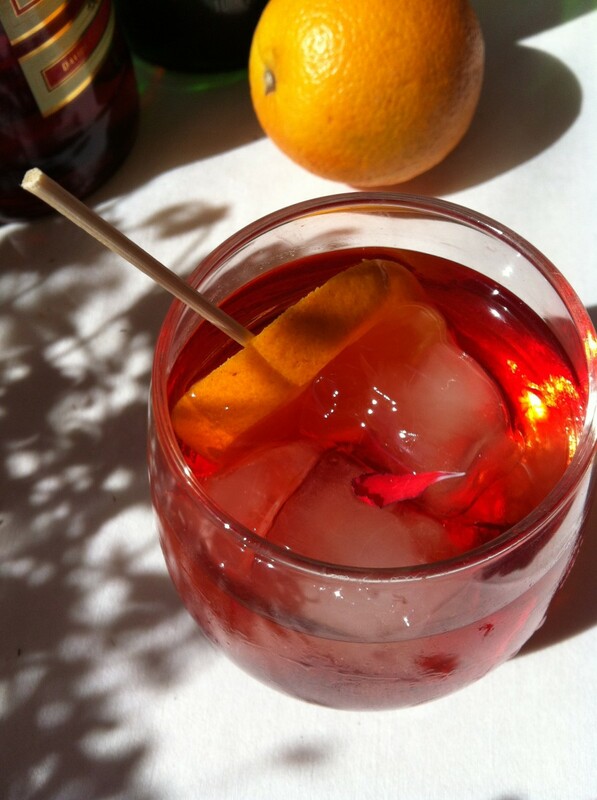 Today the Negroni is by far and wide one of Tuscany's most enjoyed famous bartender recipes. A famous Florentine barman during the flapper days, Fosco Scarselli served cocktails to the gentry and fun loving people of Florence at a famous bar called Casoni. When the bar changed hands, and became Caffe Giocosa, Scarselli was no longer a part of it. Instead Count Gherardesca invited him to be the barman at his Golf Club dell'Ugolino in Impruneta, Florence where Scarselli spent the best part of fourty years - and invented yet more famous cocktails such as the "19th hole" and the "Mercedes". He was awarded a medal by his Italian barman profession (A. I. B. E. S) with the dedication "To Fosco Scarselli, the genius who invented the Negroni"
It's a potent cocktail with quite a high alcohol content. Mixed with the oxygen in the ice, it's a fast track to a pleasant happy hour high! During the summer months (May till October), you can buy a €12 ticket for a Thursday evening visit to the Terrace of the Ponente della Galleria wing of the Uffizi Gallery between 19.00-22.00, (or other venues). The principal Terrace for the-cocktail-with-peanuts is called 'Loggia dei Lanzi', which hangs fifth and sixth century masterpieces by 'foreign' painters. It's a good idea to telephone to reserve 055/294883. The initiative is a new and an ever- more popular one. The terraces or venues to hang-out at the museum to enjoy the art, the buzz and the Negronis is a changeable venue. There are already cocktail hours planned at 'Bargello', and at the 'Sala del Michelangelo e del Rinascimento Fiorentino'. In Tuscany a Negroni is the fun and fashionable drink to order, automatically. 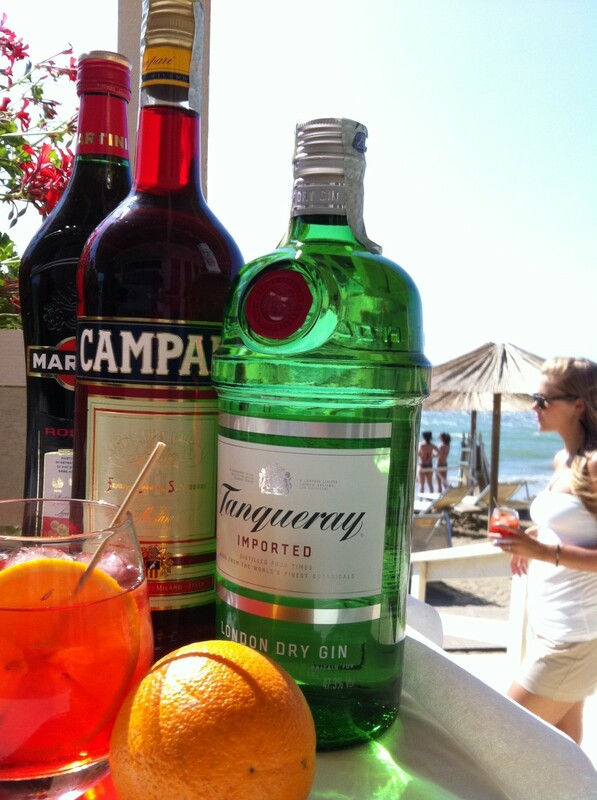 Getting together after work or at the weekend by the sea, by a pool, at beach parties, in the city squares, looking tan and beautiful, has become synonymous with the Negroni cocktail. I don't drink myself, but when I asked a friend why everyone drinks Negroni in Tuscany, he explains it's the "perfect thirst- quenching kick of a flavorful drink, besides Campari and Vermouth are Italian aperitif drinks!" Its herby, juniper flavors (gin) mixed in equal parts with the the bitter taste of mysterious Campari, whilst sweetened in a densely cordial way with red vermouth makes it a culinary balancing-act of tastes. Served cold on clinking ice, makes it seductive to hold and refreshing. 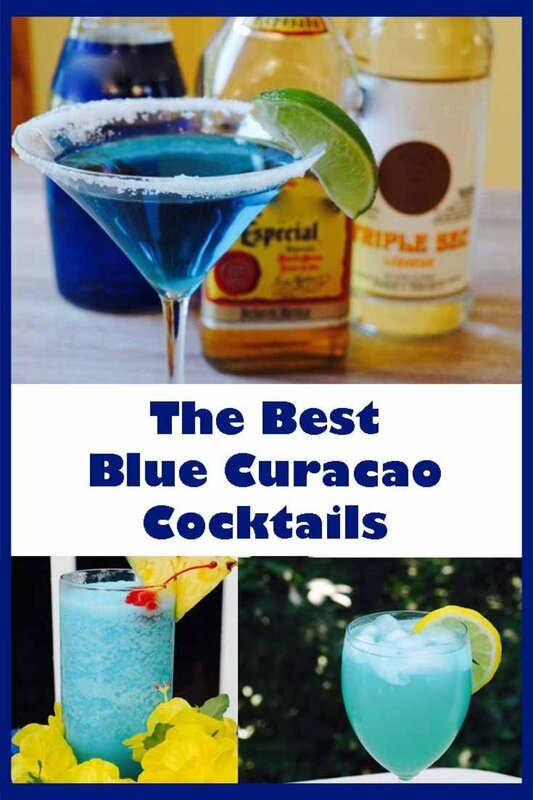 Its strong alcohol content makes it a high fix and because people move on to dinner, or to the evening elsewhere, it's a one-off drink. It sort of sets you up! One's enough! The new frontier for popular gatherings is romantically at the The Uffizi Gallery in Florence - on the terrace. Just a few meters from Botticelli's 'Venere' and the 'Ermafrodito' (The Hermaphrodite). People socialize and chatter and drink Negroni celebrating their heritage (cocktail and art, both), perhaps proposing something romantic over Perseus's head, or while looking at masterpieces by Rubens or Velasquez, or Goya. Florence is where the Negroni comes from. Florence is where it is truly celebrated. 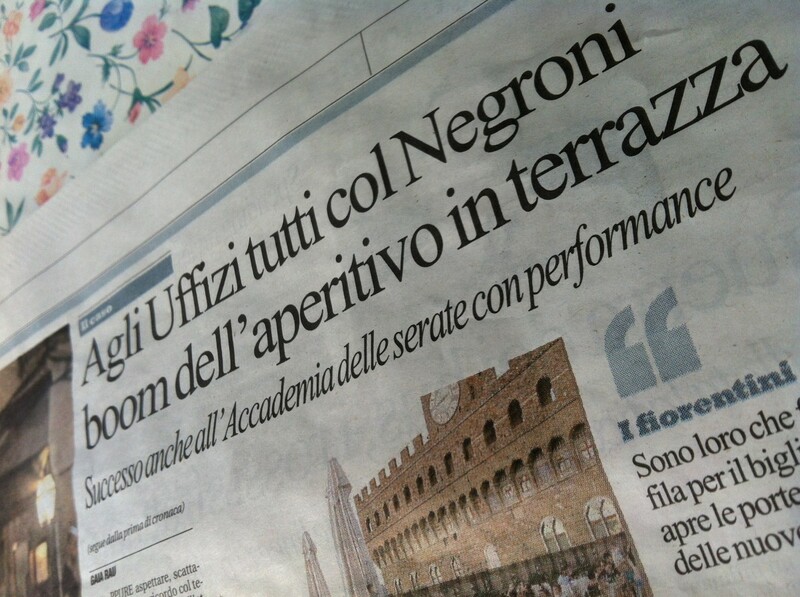 (Florence is Firenze in Italy). Negroni Sbagliato (pronounced Zba ly ato) is a Negroni but its a less alcoholic variation of Negroni. 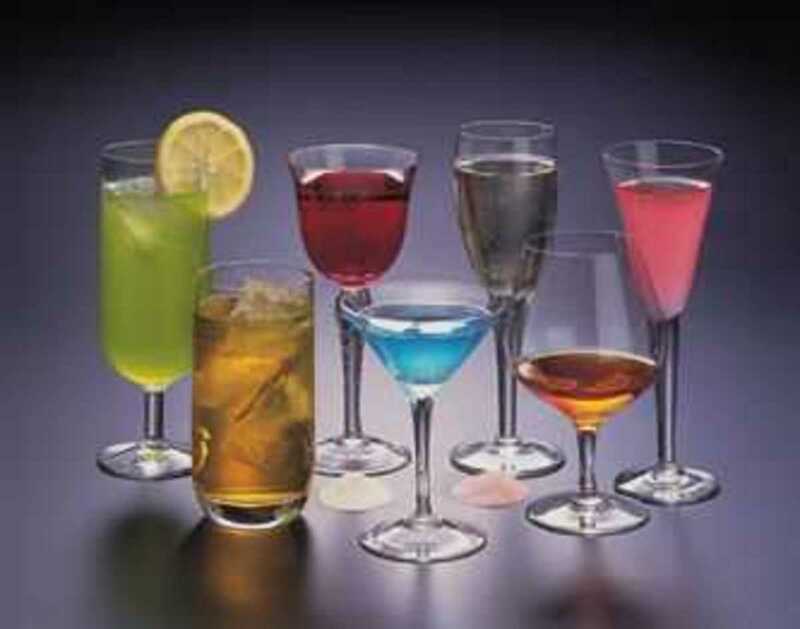 Bartender Mirko Stocchetto created it in the 1960's in a Milan bar called 'Bar Basso'. 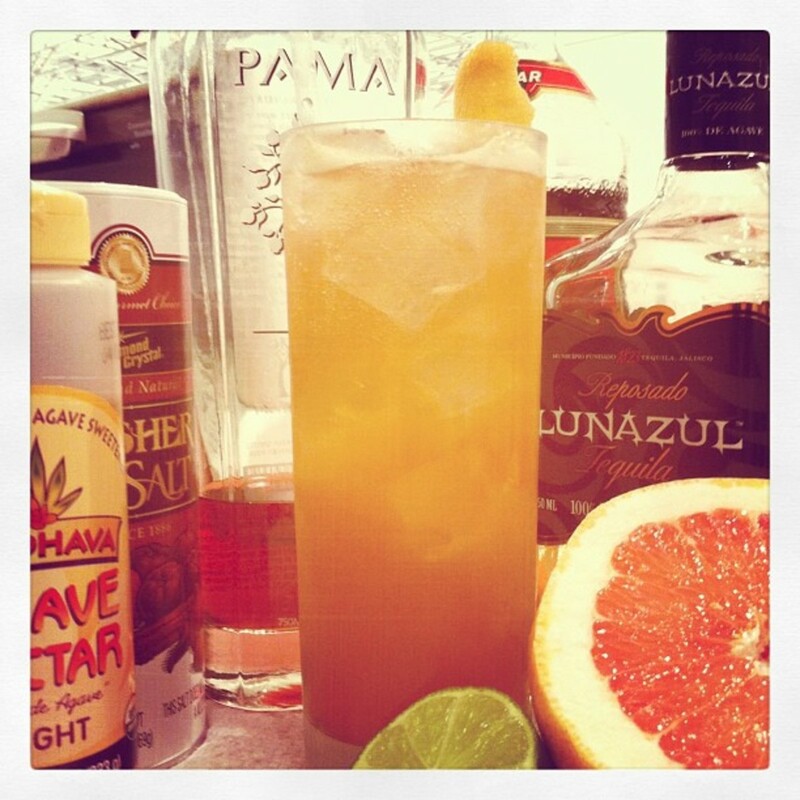 He substituted gin with spumante brut - and named it a Negroni Sbagliato. (Translated, the word 'sbagliato' means 'by mistake'). Bar Basso is the most popular evening social meeting ground for designers during the Milan Design Week. Everyone who's anyone hangs out here. The drink was an immediate success and in Italy it's cool to ask for "Un Sbagliato, per favore!" (omitting the word Negroni). A 'Sbagliato' is made in exactly the same way as a Negroni; same cold glass, same proportions, except that gin is replaced with spumante brut and perhaps a dash of angostura bitters, if you like a bitterish flavored drink. You're a pal tisontitan! Many thanks. I'm one of those who doesn't drink either but your beautiful pictures, story and recipe made this hub worth reading. I know a few people who might like this though! Great job Goodlady. wilderness. "Cheers" to you and your wife and hope you really enjoy the cocktails on your new deck! Just Ask Susan. I think if you once liked gin, you could like this quite well. Enjoy! DzyMs Lizzy 3cl is 30 mls (or 3 parts/ 3 tablespoons). Hope your friends really enjoy this. It's a good drink! Thanks for commenting. Mklow1. Have a ball! Thanks for comment. moonlake. Then the green bottle is your for your tree" Absolutely. Appreciate your vote. Thanks. Great information. I don't drink but I wouldn't mind that green bottle at the top of your page for my bottle tree. Haha. Fun article. 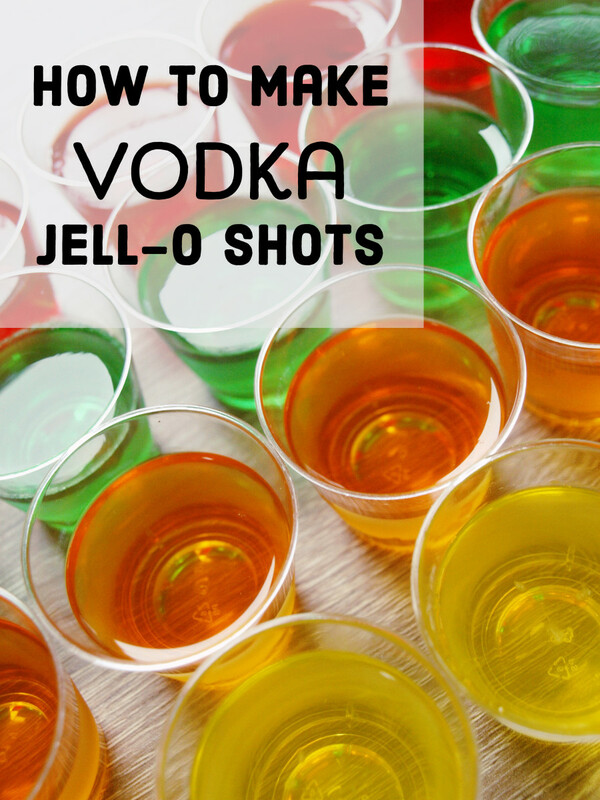 I can't wait to make that for my guests! Interesting, but I must ask, what amount of ingredients does "cl" stand for? Here in the USA, we don't use metrics, and I don't recognize metric abbreviations other than the most common, such as "km." 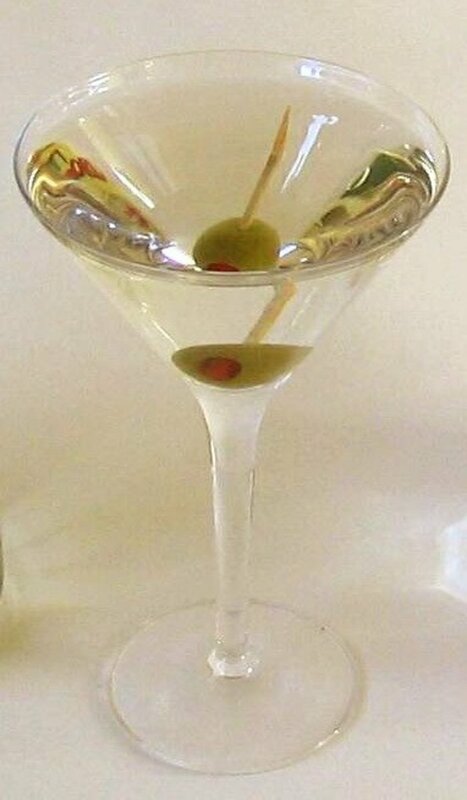 I can think of several folks on my list who would enjoy this cocktail. Thanks for sharing. Voted up and starred. 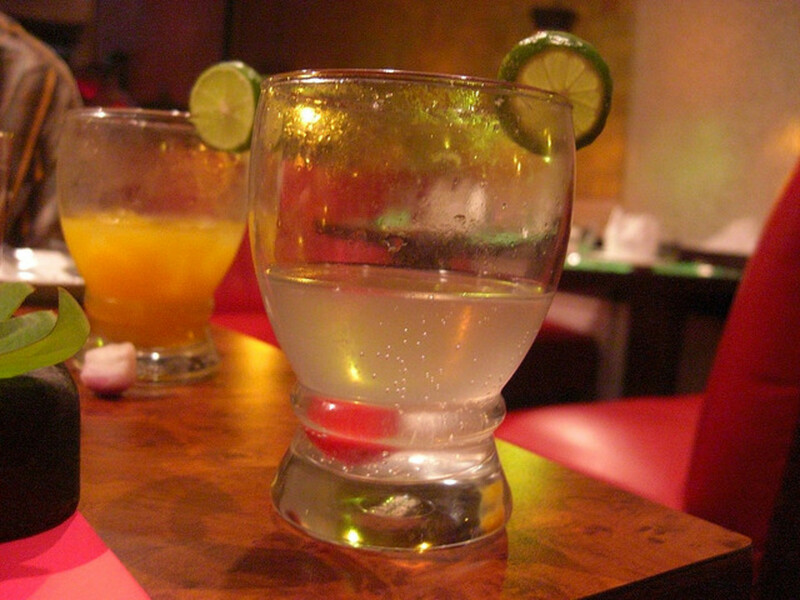 Tanqueray and Tonic used to be my favorite drink of choice. Have not had gin in years but your recipe for negroni sounds good and will have to try this. I'm not big on cocktails, but my wife likes them and this one looks good. We'll have to give it a try. Ooh, looks delicious - wish I had found this during the summer, but I'm sure it will taste just as nice in the autumn! Hi Sarah, Yes, it was a lovely day and we couldn't have done this without you! Nice to hear from you! Thanks for everything and comment. It was such a lovely day, and delicious drink! Bit strong for me, but Ian loved it!! Gorgeous post. It's supposed to be seriously good so hope you and friends enjoy. Gin is my very favorite, but I don't really know any recipes other than the standby gin and tonic. Oh, and I make cosmopolitans with gin...I swear it really is good. Thanks for adding to my repertoire for my favorite adult beverage! Good to know that the locals order, I guess when I visit Italy I will need to try one of these to "fit in"
Hope your friends like this drink. It has quite an interesting taste and is most festive and seductive in the summer. Although I don't care for gin, these recipe's sound amazing and refreshing. I shall pass it on to my friends. Great pictures too! Gooooood! You HAVE to come, it's so fun on the beaches. Thanks! This makes me want to visit Tuscany more! Fun read! That's nice. Hope your mum likes it; pretty alcoholic! Thanks for votes and sharing!